The United Methodist Committee on Relief (UMCOR) provides humanitarian relief and disaster response to over 80 countries including the United States. It specializes in solutions that help people become self-reliant and spends 100% of designated donations on the projects donors specify. Our church travels to the Salt Lake City depot to provide volunteer assistance in sorting and boxing relief supplies. 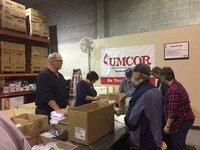 We also support UMCOR with donated supplies and funds. This is one of our newer Mission Endeavors. In October 2016, we sent a group of 6 along with the Goldendale UMC to spend a week in Salt Lake City at the UMCOR West Depot. What an experience! A few spent most of the week in the sewing room, sewing school kit bags, washcloths, receiving blankets and more for the various kits. The rest of the crew worked building kits from supplies furnished by our church family and churches across the country. They were able to complete enough school kits to fill 12 pallets. Each pallet contained 1,008 school kits to be sent around the world to children in need! This was no small feat! During the week of UMCOR, those of us in the sewing room were able to complete about 50 school bags. We thought we were doing so great…..until we heard about how many thousands of school kits the crew in the other room filled! 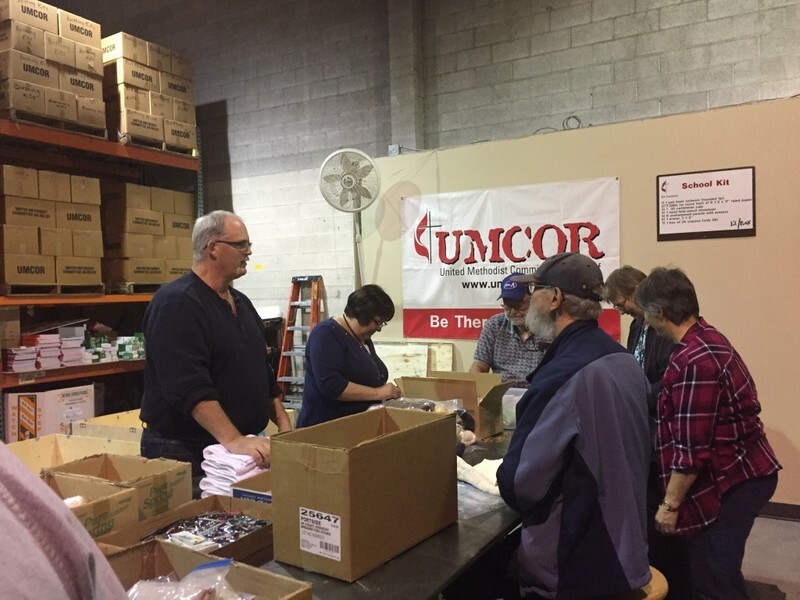 We were awestruck at the need and accomplishments of United Methodist Churches across the states to supply UMCOR with the materials it takes to sew and fill those thousands of school bags for children. A Missionary notified UMCOR about a child he meet in the jungle with one of the UMCOR school bags he carried around his neck. When asked “What do you carry in your bag?”, the child responded, “Everything!” His one little 15” x 18” bag held all of his personal belongings. He slept with it, ate with it, played with it around his neck. That school bag was the most precious commodity he owned. When we sew these school bags and fill them with pencils, paper, erasers and the rest, we have no conceivable idea what that does for the child who makes the best he/she can of his/her life in a disaster area or third world country. But it is so much more than something trite to them. Their bag may hold the necessities needed for their survival. Join us in making 2017 with UMCOR another great year! Thank you for your awesome generosity! Please see http://www.umcor.org for more information.